Why the Earth is not visited in ‘large masses’ by extraterrestrial forms of life, but only in a certain small number, is because our solar system is practically an enclave of our Milky Way. As a very far-reaching system of a spiral arm of the Milky Way, we are outside of all usual flight paths of the extraterrestrials. The SOL system, as viewed from the Milky Way, represents something of a ‘Solitary system’ or ‘Forsaken System’. Meier (pg. 18): Graphic representation of the Milky Way. For comparison, right below in circle is our Solar System as a remote enclave. When the man of the Earth want to visit the nearest stars, then he would have to bridge a distance of 4.5 light years, for so far are the stars nearest to the Earth, the Alpha Centauri group and so on – 4.5 light-years correspond to a distance of about 38 trillion kilometers. For this distance to rush through, light needs to travel for 4.5 Earth years, at a speed of about 300,000 kilometers per second. With the speed of light we would need 4.5 years from the Earth to get to the first stars. The same assertion that our Sun lies on the outermost fringes of the Milky Way, has also been reiterated few other times in the following contact reports. 95. The Earth, however, with the SOL system is truly so far from a galactic arm of the Milky Way that it is considered an enclave and has only sparse influx from other inhabited stars. 96. It is simply not interesting enough to be visited to a large extent by foreign forms of life. 97. In truth, it is practically always the same visitors from the vastness of the space which enters and leaves the Earth, as we do; foreigners may come to the earth two to three times a year. 643. The SOL system exists in the outermost realms of a spiral arm, and forms, so to speak, an enclave, and therefore the SOL system is one of the oldest systems in the galaxy. Now, is it really the case, as Meier and the Plejaren ETs explain, that our Solar system lies in the outermost fringes of the Milky Way (for a moment ignoring the galaxy’s shape)? 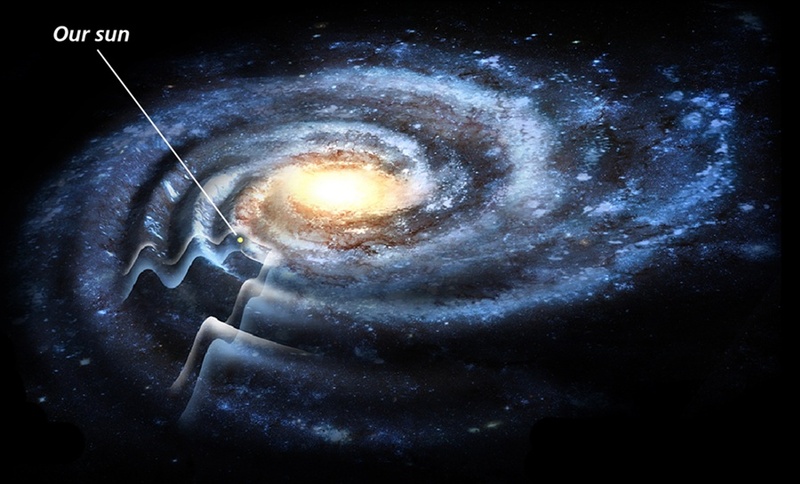 The NASA illustration depicted below quite evidently indicates that our Sun is nowhere near the outermost fringes of the Milky Way (whose diameter is around 30 kpc or 100,000 ly), but lies very much inside the Milky Way, about half of the way out. And to be exact, in the Orion spiral arm at around 8 kpc or 26,000 light years distance from the Supermassive Black Hole at the center of the galaxy. And according to the most recent 2015 estimate, the size of the Milky Way is found to be around 150,000 light years across. If this is true, then this means that our Sun sits about 1/3 of the way out from the center to the edge of the galaxy, as shown below. The Milky Way currently appears as a band all around us in the night sky i.e. it covers an angular size of 360 degrees in the sky. However, from the perspective of Meier’s location, this angular size will be greatly reduced to just about 160 degrees in the sky. Also, the stars and the constellations they make in the sky would be vastly different to the ones our ancients had observed and recorded through out the history. And when looking in the direction opposite to the center of the galaxy, probably we will be able to see more objects that are farther away because stars, gas, dust, etc. that are obstructing our view within our galaxy would not be in the way. 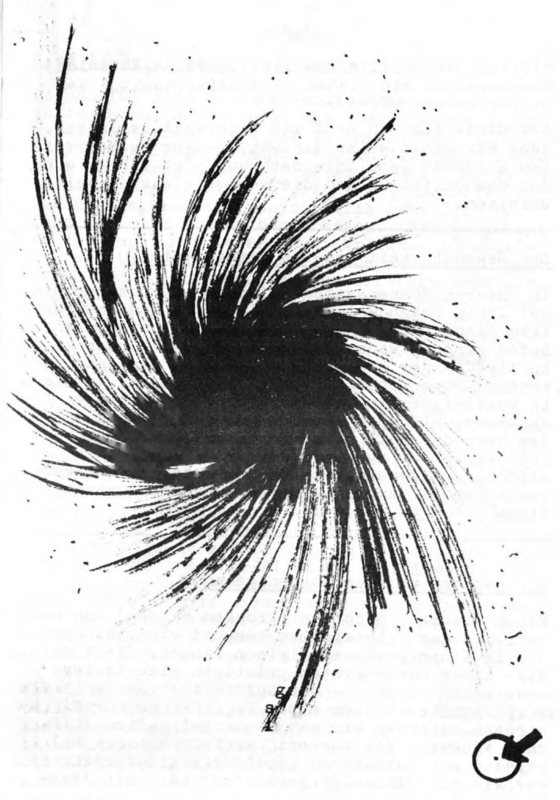 And coming to the shape of the galaxy, it is not clear whether Meier provided us with his/ET’s “accurate” representation of the Milky Way or just a rough sketch. If it is indeed an “accurate” representation, many stark differences can be immediately found from visually comparing it with the shape our scientists have come up after over a century of observations and refinements – a large barred spiral galaxy with four major arms and and least two minor arms or spurs. The many disparities are quite self-evident. We don’t know how or what awakened Meier’s common sense, decades later, he began to publish relatively plausible or precise information regarding the location of our Sun. Meier, who once positioned our Sun being at the outermost fringes of the Milky Way galaxy has later pinpointed the actual location – Orion’s spiral arm – and modified his later contact reports accordingly. ..for example, in our spiral galaxy, in which we exist with our solar system in the outer regions of a spiral arm, and to be sure, in the so-called Orion spiral arm. 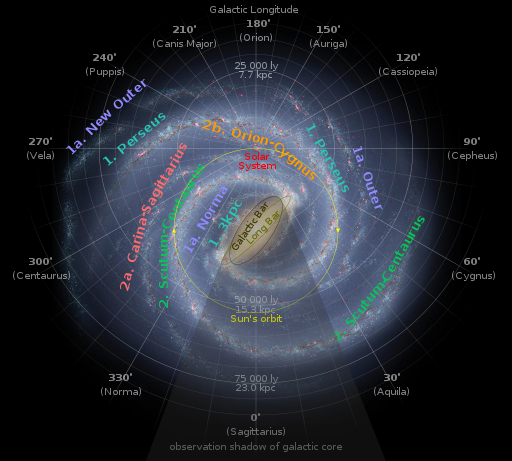 Not only was the region of our Sun’s location (Orion spiral arm) amended but also the distance from our Sun system to the center of the Milky Way. Meier, who first published this distance to be around 53,000 light years (ly) in 1979, later in 2004, changed this number to a relatively modest 35,000 ly, about 20,000 ly less. However, as mentioned earlier, the accurate distance determined by scientists is around 27,000 ly, a difference of around 8 ly compared to Meier’s. 98. The galaxial center, or the galaxial central sun, is at a distance of 53,000 light years, when SOL (Note: Solar System) is taken for the starting point of measure. Isn’t it ironic–and comical–that Meier in an old contact report (CR 69) blamed scientists for an erroneous distance value of 30,000 ly, to then later (in CR 224 and CR 236) contradict himself by defending a proximate value of 35,000 ly? For more debunking on this discrepancy between the distances from our Sun system to the Milky Way’s center in different Contact Reports, refer to this and this page. The above analysis quite evidently reveals the hallmarks of a shoddy coverup attempt made by a naive and scientifically illiterate person – like Meier with a sixth grade education – to cover up his fraud of fabricating Contact Reports! We are very curious to see if Meier retained the same graphic representation of our Sun system and Milky Way in his newly printed UFOs: Raumschiffe von fremden Welten booklet. We suspect that either the illustration (and text) has been amended or the entire article deleted. If any of you have this booklet, kindly share the information with us. Older: Billy Meier’s “Love” Teachings 101: How to steal another’s wife?